There are currently 185 people online. 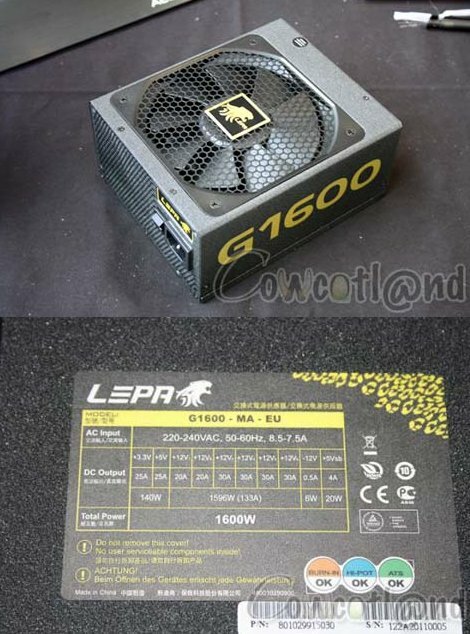 Legit Reviews spotted pictures of the LEPA G1600, an upcoming 80Plus Gold certified modular power supply with six-rail +12V design and a maximum output of 1600W! Pricing and availability is unknown. The G1600 achieves its 1600W max by using six 12V rails, two of which are rated at 20A and four at 30A with a combined rating of 133A for a total of 1596W on the 12V rails. The 3.3V and 5V rails give 25A each with a combined total of 140w. Cooling for the unit is handled by a 135mm fan. The cabling is again fully modular and consists of two 8pin EPS connectors, 12 PCI-E connectors, along with the usual boat load of Molex and SATA connectors.